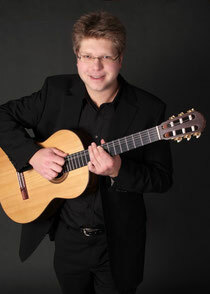 Mirco Oldigs studied classical guitar at the Luebeck University of Music with professor Albert Aigner. In noumerous masterclasses, e. g. with Carlos Bonell, Manuel Barrueco and Pepe Romero he gained further inspiration and artistic experience. In addition to his work as a concert musician (which led him e. g. to Austria, Norway, Hungary, England, Spain and Mexico) he performed in several radio- and TV-productions (e. g. of the North German Radio). His repertoire consists of works of all epoches and styles from renaissance to avantgarde music. Both audience and critics praise his amazing versatality in sound nuances and musical expression. As a composer his intention is a synthesis of different musical phenomenons. Moreover he is very engaged in chamber music projects: he is member of different ensembles and one of the founders of the Guitar Trio Luebeck. 2003 his first solo-album "Nightshade rounds" with various compositions of contemporary guitar music was released at the label "ambitus". The CD "Imaginations" (with the Guitar Trio Luebeck), which was published 2010, contains mainly his own compositions.